Sure, you love your morning caffeine just for the little zing it puts in your step. But turns out, the aftermath of your daily caffeine fix may be more complex than simply stimulating your central nervous system and jolting you awake. Recently coffee has been making headlines for its health benefits. Yes, you read that correctly. 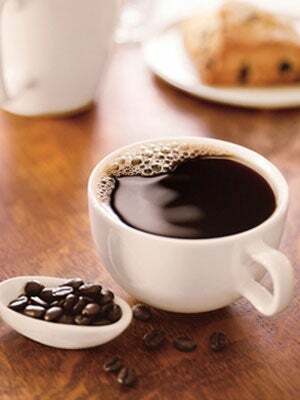 From preventing cancer and depression and acting like a natural antioxidant to ward off oxidative stress (inside and out), coffee is getting a lot of good press lately. A few tiny tweaks to your caffeine routine and you can totally make that drink do double duty: It'll get you going and do your body (and skin and mind) good. From how you drink it to what kind of bean you prefer (yes, the roast you choose does affect more than your taste buds), this guide has everything you need to know before you jump in line at Starbucks. “Coffee is packed with antioxidants as well as magnesium and chromium, essential minerals that your body needs,” says Keri Gans, RD, CDN, a nutritionist in New York City and author of The Small Change Diet. But coffee can also contain some not-so-great stuff so it really does matter what you order on a regular basis. “Unfiltered coffee contains higher levels of cafestol, a compound that can elevate LDL (aka bad) cholesterol — but when coffee is brewed with a filter (like classic American drip), most of the cafestol is removed,” explains Gans. What is unfiltered coffee you ask? Think: Espresso (as in the straight stuff and what’s found in a yummy latte) as well as Turkish coffee and the kind that comes from a French press. Gans adds that it’s not so much how much coffee that you drink that you should worry about (although she says to try and cut if off at two cups a day) as much as all the flair you add to it. Soy latte! Cappuccino! Caramel macchiato! “When you add milk and sugar to coffee, you’re increasing the calories depending on the type of milk and the fat content — so if you can, limit those or drink it black,” she says. How do you know if maybe you need to take your coffee intake down a notch? “Once you start feeling negative side effects such as irritability, headaches, sleeplessness, and for some, heartburn,” says Gans. Other noteworthy perks of sticking to your guns and drinking coffee every single day? There's some evidence that it wards off skin cancer. We aren’t saying to stop slathering that broad-spectrum SPF or anything but hey, a little extra UV shield from the inside out just by sipping on your favorite drink, that doesn’t sound so bad. A study presented at The American Association for Cancer Research International Conference on Frontiers in Cancer Prevention Research in October of 2011 showed that women who drank three cups of coffee daily had 20 percent reduction in risk of developing basal cell carcinomas (a type of pre-cancer) than those who didn’t. Recent research from Rutgers University Ernest Mario School of Pharmacy in Piscataway, New Jersey, finds that combining sweat sessions with your coffee habit could decrease your risk of skin cancer, too. [Note: the study was done in a lab on mice] The study found that those who had caffeine and exercised developed 62 percent fewer skin tumors than those who didn’t. Coffee can also help put you in a better mood. Women who drank four cups a day were 20 percent less likely to be deemed clinically depressed than those who only drank one. 50,739 women who reported they felt more alert, had more energy and were in a better mood post-coffee than those who didn’t get a caffeine fix, a study in the Archives of Internal medicine, finds.